Strabismus in children and adults can now be successfully treated if timely diagnosed and treatment begins. Wearing glasses or contact lenses, in order to recover low vision, doing eye exercises for strabismus surgery or ocular muscles give much better results if the disorder is diagnosed at the time. Strabismus, or crossed eyes is the inability of both eyes to simultaneously view the same thing. Namely one eye is looking at the subject of observation, while the other turns inward, outward, upward or downward. Healthy and parallel position of the eyes is important for high-quality visual development in childhood and throughout life. Hereinafter, learn more about the causes, symptoms, treatment and other specifics of the disease. Strabismus in children and babies is mainly the result of uncorrected refractive errors (near-sightedness more often than foresightedness, and sometimes, due to the different refraction in both eyes - anisometropia). Possible causes of strabismus in children are eye diseases that cause a decrease in visual acuity (congenital cataract), disorder in the structure or function of the muscles responsible for the initiation of an eye, and problems in the development of reflexes in the brain important for "cooperation" of eyes. Strabismus in children is quite common problem in the world. Today we know that vision is not developed immediately at birth - his development begins with watching and is the most active in the first two to three years of life, and that is the most critical time for the formation of amblyopia caused by strabismus. No matter what subspecies it belongs to, strabismus in children, requires special attention, regular visits to the ophthalmologist, detailed analysis and timely treatment. Crossed eyes in adults may be due to different diseases: cancer of the eye or brain, traumatic injuries-quite frequently occurs as a result of road traffic injuries, stroke, and botulism. Strabismus in adults frequently occurs with members of the family, and is the undisputed particular role of hereditary factors. However, the greater the possibility that this disorder occurs in premature infants is low. For a good and healthy vision, it is necessary for both eyes to be on the same level and to participate together in the formation of the image. The ability of the brain to create a single image obtaining information from both eyes is called binocular vision. In fact, if we turn one eye, the brain receives two completely different images that cannot be processed. Initially, the main symptoms of strabismus are double vision, loss of three-dimensionality and forced head position. Double vision eventually disappears, because the brain learns to eliminate the one you get from weaker eye. This leads to the formation of amblyopia, reduced visual potential of the eye due date as a condition known as "lazy eye". Visual impairment is the most severe functional problem with strabismus because if not treated on time it remains permanent. Typical is a division of strabismus to true and false, so-called pseudo strabismus, and to manifested and latent type. Strabismus can be congenital (inborn) and acquired, unilateral (one eye) or alternating. 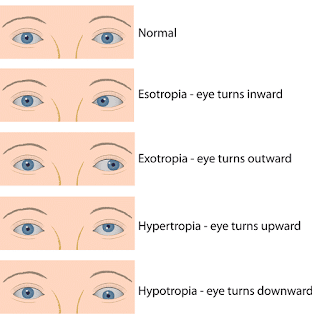 Basic classification of real strabismus refers to the movement of muscles and direction of deviation of the eyeball. When regarding the mobility of muscles, we have concomitant and paralytic strabismus. 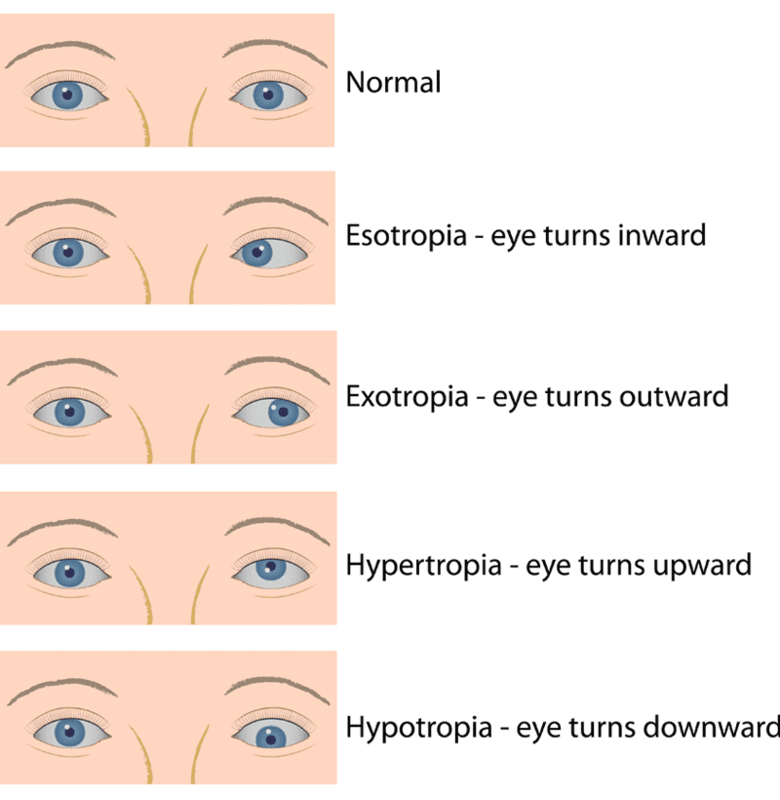 Under the direction of the deflection of the eyeball, we differ esotropia (the eye turns inward), egzodeviations (turn outward), hypertrophy (turns up) and hypotrophy (turns down). Early diagnosis is crucial for successful treatment of strabismus. Diagnosis should be placed as soon as possible to tart the treatment and prevent the occurrence of visual impairment. When it comes to strabismus in children, a review can be done already when the child is one year old, a special diagnostic methods, and an insight into the depth of the disorder is done. If you create a good relationship with a small patient, all tests of visual function can be carried out without difficulty. The ideal would be to conduct a systematic review of sight between the third and fourth year, but not before. Developed countries have developed programs for eye examinations for children aged three to four years, and this model is slowly introduced around the world as well. The most common treatments are strabismus correction of optical refractive errors by wearing glasses, then contact lenses, prism glasses, occlusion, different exercises for strabismus or ocular surgery of muscles. With treatment we optimize visual acuity of each eye, binocular vision and cooperation of both eyes, aesthetic effect and better position of the head in some cases. In surgery, strabismus in children requires intervention that is performed under general anaesthesia, while in adults of local and general are used. After the surgery exercises are necessary - more specifically exercises for ocular muscles and appropriate optical correction to maintain the achieved condition, and sometimes due to insufficient or excessive correction of the ocular muscles surgery needs to be repeated. Especially it is important to emphasize that the long-term treatment of strabismus does not always provide the expected results. Therefore, strabismus requires maximum engagement of the doctor and the patient. HOW TO PREVENT STRABISMUS IN CHILDREN ON TIME? If any anomalies - eye refraction is timely detected on time and make timely corrections, whether it comes farsightedness, near-sightedness or astigmatism, it is possible to prevent occurrences such as strabismus and amblyopia. If necessary, implementing the respective classes of ocular muscles, and the closing or occlusion of the eye to better provide the maximum potential of the weaker eye, the optic (with appropriate optical correction). To implement this kind of protection, it is important to once again note the importance of early systematic review of children's sight because it is also the most effective measure when it comes to strabismus in children.